I would love to know how many hundreds of forest industry reports, strategies and reviews have been written in Australia over the last 50 years; how many thousands of dust-covered pages now lie forgotten on library shelves? And straight away from the title of the report it is clear where the focus of the report lies, and why we have another industry report already consigned to the dusty library shelves. The focus is the forest industry, the wood processors. Once again wood growers are the minor party in the scheme of things. The maxim that the only basis for a successful forest industry is profitable tree growing is completely absent in this report. In fact the word “profit” is completely absent from the report. 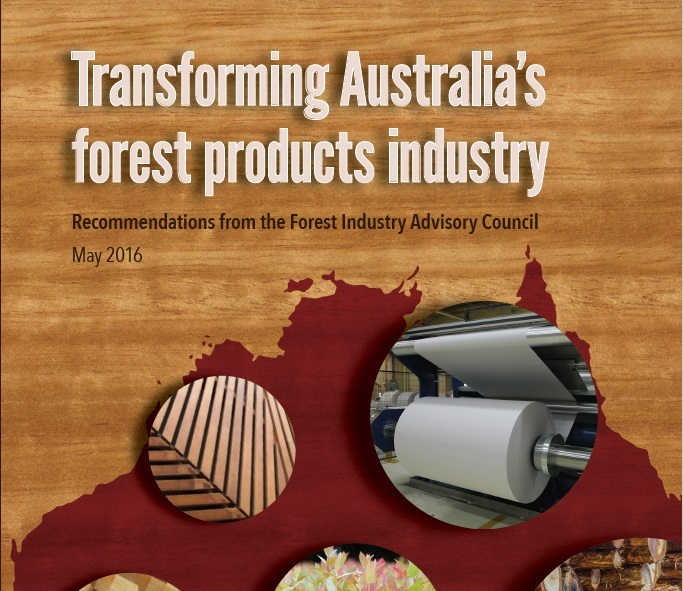 This report originated in the Tony Abbott government era when Richard Colbeck, minister responsible for forestry, established the Forest Industry Advisory Council. The FIAC was tasked with developing yet another vision for the future of the industry. It’s a political document. It’s not a business plan. It’s not a report designed to engage the rural community, nor the broader Australian community. So why am I bothering to review this new report? Well at least the report does mention farm forestry, if not in a very encouraging manner. Farm forestry can provide an opportunity to contribute to the industry’s resource needs through increasing the volume of wood. Landholders can derive financial returns from farm forestry through improved land values and on-farm benefits. Benefits include: shade and shelter for stock or crops; soil and water protection; erosion control; reversed salinity; and increased biodiversity, landscape and amenity values. No mention at all of profits or good financial returns from tree growing, just secondary benefits from trees on farms. Are farmers expected to sell their trees at a loss to subsidise the forest industry? That kind of talk will definitely ignite the interest of rural community!! The report then talks about barriers to farm forestry investment and participation. Recommendation 5: That industry develops a strategy for expanding the productive forest estate in strategic regional hubs through farm forestry, and identifies the role for government. Well we already have a strategy developed including a role for Governments. As I identified in an earlier blog it’s called the National Action Statement on Farm Forestry (NASFF). It was written in 2005 and currently resides on one of those dusty library shelves. This new report has a list of references at the end that does not include the NASFF. Curious! Recommendation 19: That the Australian Government convenes a meeting of state and territory ministers responsible for forestry to discuss issues raised in this paper. Yet another ministerial meeting. Another talk-fest! Instead of expecting politicians to solve the industries many problems why doesn’t the report have a list of all the new initiatives that the forest industry is implementing to move towards this new/old vision? Does the forest industry know anything about profitable tree growing? Unfortunately there is nothing in this new report/vision for growers of high value timbers such as blackwood. Isn’t this just so predictable and pathetic? Just when we start to get some real debate and transparency into the Tasmanian forestry wars along comes the Honourable Minister and slams the door. It was so newsworthy that it made both the major State news media. What is the purpose of an advisory council if “everyone is on the same page”? That’s not an advisory council. That’s a political smokescreen, a whitewash! The whole purpose of an advisory council, as Sue Smith said, is to promote and foster vigorous, open discussion and canvas as wide a range of opinions and options as possible. The Tasmanian forest industry is going absolutely nowhere until the future of Forestry Tasmania is resolved. And after 21 years we know that the GBE business model has been a total failure. Forestry Tasmania remains the “albatross around the neck” of the forest industry. So vigorous and open debate about this issue is absolutely fundamental. And yesterday the State government shut that debate down. Judging by the response in the media the Tasmanian community is absolutely sick and tired of the continuing political games and squandering of taxpayers money on the forest industry. But the advisory council and our politicians just aren’t listening. The issue of retaining skills is yet another forest industry furphy. The one and only skill that Forestry Tasmania needs right now is to be fully commercial and profitable. Without this fundamental skill everything else is completely irrelevant. The advisory council is now a lame duck with no integrity, credibility or purpose. Send the bill to the Tasmanian taxpayer.